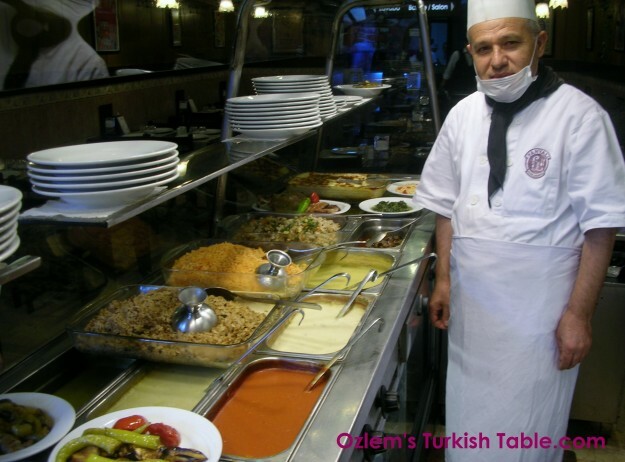 Delicious, ready to eat soups, casseroles, rice and meat courses at the Fehmi Esnaf Lokantasi, Kadikoy- Istanbul – “slowly cooked fast food”, that we Turks love to indulge. 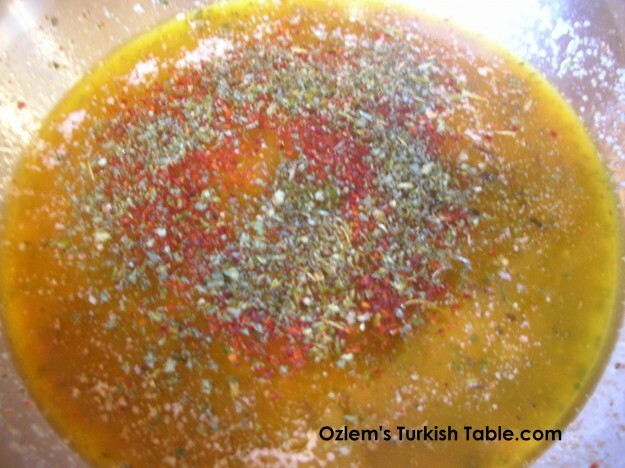 Soups, -“Corba” in Turkish-, form a very important part of Turkish diet; almost every dinner, especially in cooler months, start with soup in Turkish households. 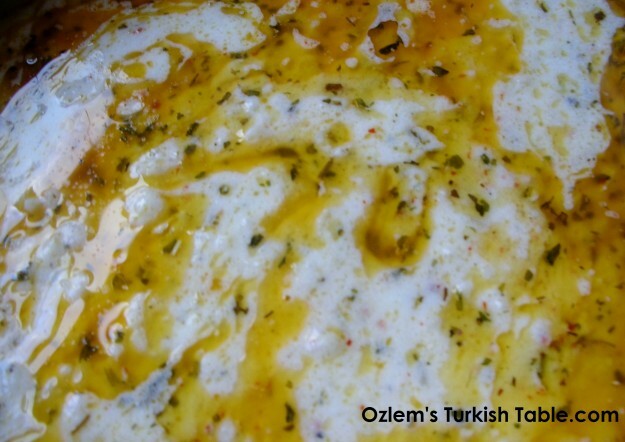 In rural Anatolia, it is very common for this yoghurt soup or the hearty red lentil soup to be eaten as breakfast, for a substantial meal, throughout the year. You see soup stalls in every town, village and city in Turkey. Yayla Corbasi, ready to eat! 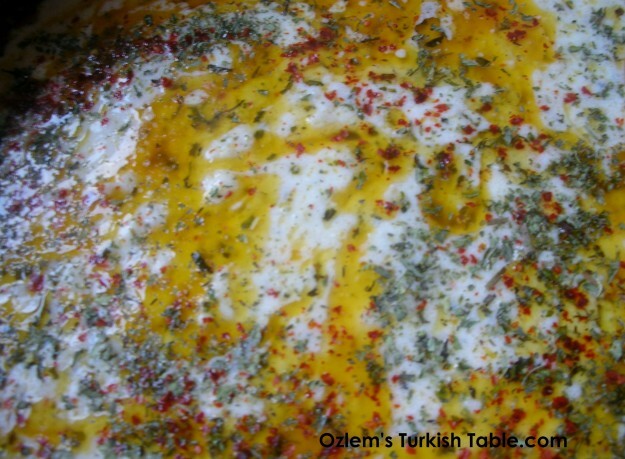 Yayla Corbasi is another good example of how you can add flavor through spices. The mild, plain taste of yoghurt is magically transformed with the red pepper flakes and dried mint infused butter/olive oil, to a different, delicious and refreshing level. I hope you can give it a go sometime. Fancy more soup? How about Ezo Gelin Corbasi – Daughter-in-law’s spicy lentils and bulgur soup with quinoa or this Tomato and vegetables soup with orzo – Sebzeli seriye corbasi ? They are ready in a short time and can certainly warm you up. 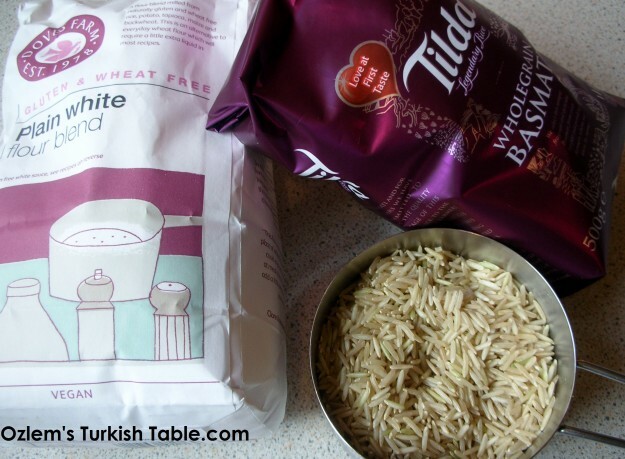 Whole grain basmati rice worked well in the yoghurt soup. Gluten and wheat free plain white flour blend replaced the plain flour really well too. 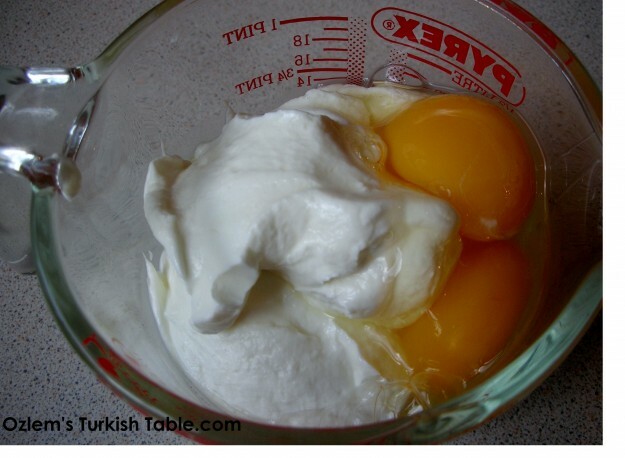 The flour and egg yolks stabilize the yoghurt and keep it from curdling. Meanwhile in a bowl, combine the yoghurt, flour, egg yolk and beat until smooth (the flour and egg yolks stabilize the yoghurt and keep it from curdling). From the pan, take a cupful of hot stock and whisk it into the mixture. Return the thickened egg mixture to the soup pan, stir in the dried mint and season with salt and ground black pepper. Stir well and simmer gently for another 10 minutes, or until the soup has a creamy consistency (please add some more water or stock if you like your soup thinner). Dried mint adds a wonderful, refreshing flavor to this yoghurt based soup, Yayla Corbasi. To make the dried mint and paprika flakes sauce, melt the butter gently in a separate pan on a low heat. Stir in the dried mint and paprika flakes, stir and cook on a very low heat (so that the spices don’t burn) for about 30 seconds, until the spices start to sizzle. Whisk this sauce into the soup. This dried mint and red pepper flakes infused sauce will transform the taste of our yoghurt based sauce; you can use olive oil instead of butter, if you like. Serve hot with a sprinkle of extra paprika flakes for a spicier flavor, if you like. 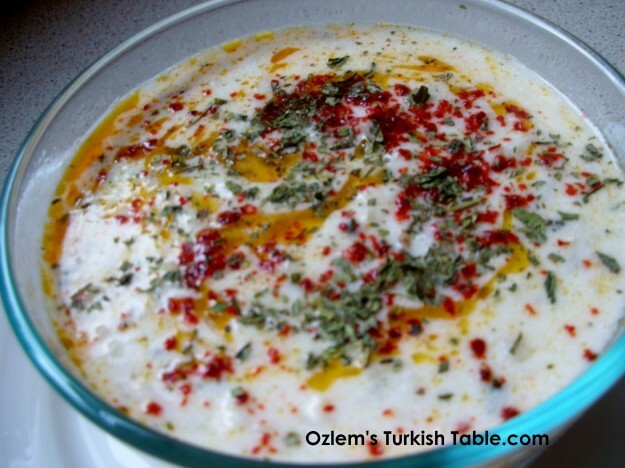 Yayla Corbasi; yoghurt soup with whole grain rice, dried mint and red pepper flakes, ready! Note: If you can’t get strained yoghurt, you can make it yourself. Here is Ghillie Basan’s tip for making strained yoghurt: Line a sieve (strainer) with a piece of muslin and spoon creamy, natural yoghurt into it. Allow the excess liquid to drip through the muslin, then transfer the yoghurt from the sieve to a bowl. that first photo is gorgeous! i can’t wait to try this soup! Sounds lovely, especially that dried mint and paprika combination. We’re definitely in need of soup at the moment. Wisley is lovely in winter – well, actually, it’s lovely at every season. I’ve been trying to visit for weeks – maybe I’ll get a chance soon. Love seeing the ‘slow cooked fast food’ in Turkey, now that is fast food I would eat:) And Wisley gardens do look magical! Having got soaked to the skin on our walk today, this looks like a good pick-me-up soup. I didn’t realise that it was so easy to make. This is such an interesting soup. I never come across this before. I would impress my guest at the dinner table with something like this. Interesting flavours packed in here. I had a virus on my server so my site was not accessible yesterday. All sorted now.. phew! Glad your server got sorted – aint no fun : ( and so glad you liked the soup! Just made it. Perfect took me back to fethiye with the first taste.